Penthouse at the summit of downtown luxury living. 3 floors of an ultra-modern living space, ready to move in. Hot tub on your private terrace, two large loggias and one indoor parking spot. The only penthouse in the building that has a completely private terrace that is not connected to the neighbors' terraces.\r\rHave you ever wanted to call home a three-level executive Penthouse in Old Montreal area at its best? Contact the broker to arrange a showing, because this exceptionally cozy unit in a 2010 superior construction quality "M9" building is most definitely worth to be considered as your next dwelling place.\r\rThis impressively large three-level Penthouse with very functional living spaces, a hot tub on your private terrace and all the charm that conveys great comfort also includes many extras that will truly surprise future tenants. The position of the Penthouse shelters it completely from excessive heat or cold. There is a gym located on the second floor of the building. By choosing this address you will "de facto" belong to Montreal's select club of people that have the privilege to enjoy a peace of mind unknown elsewhere in the city.\r\rJust off McGill street with its famous bars and restaurants. A 30 min drive from Ski St-Bruno, steps away from the world renown night life in Downtown Montreal and the Old Port - a veritable profusion of activities that will work your body, your emotions, and your mind. How about a ride on a Segway on the famous Promenade of the Old Port, or some fishing, or an IMAX® film, a cruise, or a trip to the Science Centre? All this and more just ready for the taking. Enjoy your wondrous fun-filled life; enjoy it with your family, friends; enjoy it all just one step away from your own little noble castle! Hi, I'd like to find out more information about 90 Rue Prince, apt. 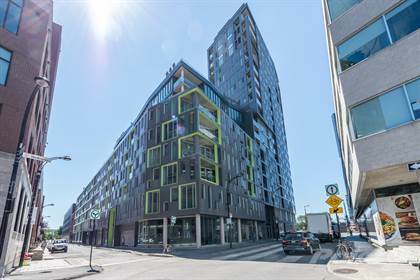 903 Ville-Marie (Montréal) H3C 2M8. Thanks so much!